Public Art can be a hit or miss endeavor. More often than not it misses the mark for one reason or another, be it budgets, design by committee, to many cooks in the kitchen, what ever. Occasionally though it ends up being pretty impressive and true to the need of the commissioning group and the artists themselves. Recently Los Angeles International Airport installed a series of large-scale, permanent public multimedia installations in the Tom Bradley terminal. The works were designed to enhance the spacial experience of travelers by bringing the architecture to life through the media features of the installations. Designed by Moment Factory the 16 unique responsive digital artworks are built to react to passenger movements with audio, video, sound effects and music being served up real-time in the space. I can’t wait until I fly in or out of LAX again so I can see these in person. Posted in Architecture, Design and Art, Technology and tagged Architecture, Interactive Art, LAX, Los Angeles International Airport, Moment Factory, Multimedia, Public Art, Tom Bradley terminal on May 22, 2015 by Author. Back in 1997 I worked on my first website design. The internet was primitive, and one of the most exciting things going on was the new Mosaic browser, which would eventually become Netscape, and animated .GIF files. So much has changed in the last 10 plus years with the way content and media is delivered it is easy to see that we are in the midst of a content renaissance. 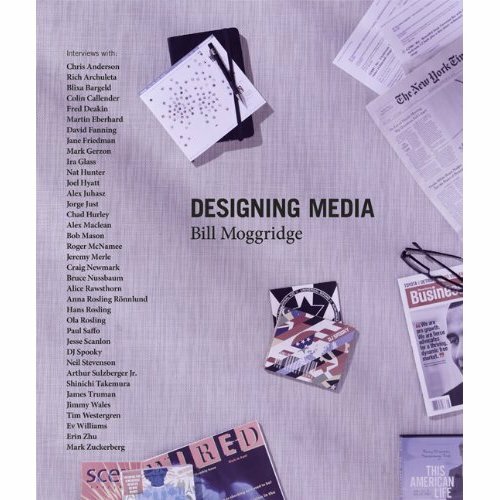 Designing Media is the new book by Bill Moggeridge, His new book examines connections and conflicts between old and new media, describing how the traditional media channels have changed, and how new patterns of media consumption are emerging. The book also features interviews with thirty-seven significant figures in both traditional and new forms of mass communication; interviewees range from the publisher of the New York Times to the founder of Twitter – also these can be viewed on the website. Mainstream media, often known simply as MSM, have not yet disappeared in a digital takeover of the media landscape. But the long-dominant MSM—television, radio, newspapers, magazines, and books—have had to respond to emergent digital media. Newspapers have interactive Web sites; television broadcasts over the Internet; books are published in both electronic and print editions. In Designing Media, design guru Bill Moggridge examines connections and conflicts between old and new media, describing how the MSM have changed and how new patterns of media consumption are emerging. The book features interviews with thirty-seven significant figures in both traditional and new forms of mass communication; interviewees range from the publisher of the New York Times to the founder of Twitter. Bill Moggridge, is the Director of the Cooper-Hewitt National Design Museum in New York City. He is a founder of IDEO, the famous innovation and design firm. He has a global reputation as an award-winning designer, having pioneered interaction design and integrated human factors disciplines into design practice. I think I’ll have some holiday reading to take care of over the Christmas vacation break, thanks to Moggeridge’s new book. Posted in Media and Mediums, Technology and tagged Bill Moggeridge, Designing Media, Internet Content, Multi Channel Communication, Multimedia, New Media on December 13, 2010 by Author.